Salmon play an integral role for coastal livelihoods, cultures, and ecosystems in Clayoquot Sound. And they lead incredible lives, starting in fresh water then migrating to the ocean. Salmon stay at sea for years before their homing instincts guide them back, to the fresh water systems they were conceived in, to reproduce. Celebrating this magnificent species is what inspires Friends of Clayoquot Sound to organize the annual Clayoquot Salmon Festival! From September 1-7 there will be a variety of events, with something for everyone. The festival aims to offer residents and visitors an opportunity to reflect upon, and build an active appreciation for, the irreplaceable value of salmon in Clayoquot Sound. At least 137 different species depend on the marine-rich nutrients that wild salmon provide. Millions of people around the Pacific rely on salmon as a healthy and reliable source of protein. Pacific salmon fuel a mutli-billion industry, supporting tens of thousands of jobs and local economies and communities around the Pacific Rim. Salmon are the essential to protecting a way of life rooted in the Pacific northwest environment. Indigenous Nations continue to lead and uphold a vibrant, life-sustaining relationship with salmon. The Surfrider Beach Cleanup and Traditional Salmon BBQ on Mackenzie Beach will enable festivalgoers to demonstrate an active appreciation for salmon conservation and culture. Salmon Forest Walk with Raincoast Education Society to better understand their ecological significance of the backbone of the coast. While a community yoga class will support the Festival. As a keystone species, salmon support wildlife such as orcas, bears, wolves, and eagles while providing nutrients to the ancient forests of Pacific Northwest. But salmon are also under significant stress in the environment from climate change and water pollutants. Join this important discussion about salmon protection, following a free screening of “Hear The Call: Salmon Nation”, with Terry Dorward of Tla-o-qui-aht First Nations, Chief Bob Chamberlain of the BC Union of Indian Chiefs, Swanson Island Occupation Leader Ernest Alfred, Nat Geo Explorer Josh Thome, and Mack Barlett of Cedar Coast Field Station. Throughout Clayoquot Sound, the remaining intact salmon watersheds composed of free-flowing rivers and dense forests, provide clean drinking water and absorb carbon, helping to guard against the worst impacts of climate change. To generate continuing discussion about the issues facing salmon, the Festival is presenting David Suzuki Foundation Fellow, Melina Laboucan Massimo of the Lubicon Cree First Nation, with inspiring presentations about climate impacts and local solutions from Tla-o-qui-aht Tribal Parks, Friends of Clayoquot Sound, and Surfrider Pacific Rim. The Clayoquot Salmon Festival is timed to coincide with the return of the salmon for spawning on the west coast. Anyone who has witnessed salmon hurling themselves upriver and over obstacles during the spawn knows their tenacious drive to give life to the next generation. The Festival has prioritized celebrating the return of the salmon together as a community with creative spirit and two stellar weekends of music. Opening night, Saturday, September 1, will feature the Spawn Til Dawn Dance Party with Frase and Butterflywingtip. While on the Upstream Shakedown on Sunday, September 2, hip hop beats and rhymes will be at the forefront with Kay the Aquanaut, Praxis Life, and Lizzy Be. The music continues the following weekend with the album release tour for The Om Sound on Friday, September 7 with The Comfortably Sauvage warming up the night. 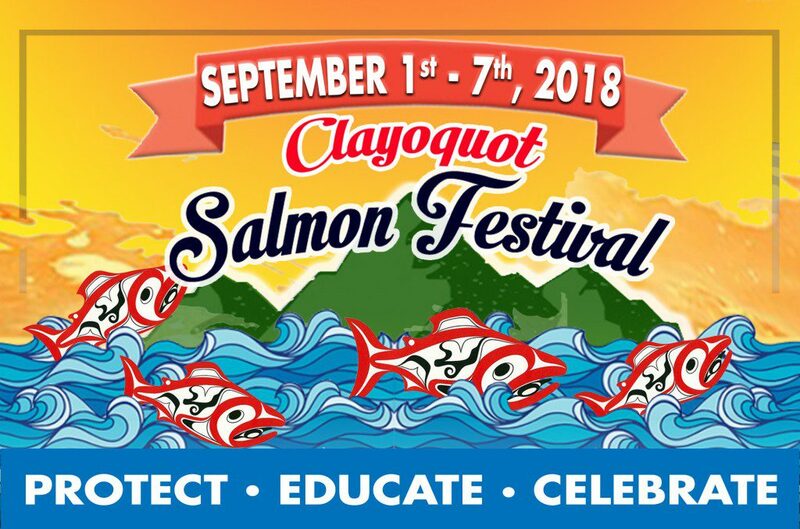 To volunteer for the Clayoquot Salmon Festival contact the festival organizers at salmonfestival@focs.ca or 250.725.4218. To stay up to date with location specifics, participating businesses, and updates, please check the festival website www.focs.ca/salmonfestival or Clayoquot Salmon Festival on Facebook. Join Terry Dorward of Tla-o-qui-aht First Nations, Chief Bob Chamberlain of the BC Union of Indian Chiefs, Swanson Island Occupation Leader Ernest Alfred, Nat Geo Explorer Josh Homme, and Mack Barlett of Cedar Coast Field Station for a discussion about protecting salmon and a screening of “Hear The Call: Salmon Nation”. In the film “Hear The Call: Salmon Nation” guest musicians go on adventures with Nat Geo Explorer and filmmaker Josh Thome to connect with inspiring leaders and the wild places they feel called to protect. Along the way, they collect the sights and sounds of the experience and in the end create a visual and musical call to action designed to rally audiences in helping protect these wild places. In episode one, singer Ashleigh Ball of Hey Ocean! travels to BC’s remote coast to meet Alexandra Morton, one of the worlds most celebrated marine biologists for her work with BC’s keystone species, salmon. Exploring the coast with Alexandra, Ashleigh is amazed to learn about the elaborate role salmon play in weaving together the entire coastal ecosystem. She is equally disturbed to learn that the wild salmon are being decimated by disease, sea lice, and othe pollution introduced from Atlantic salmon farms. Inspired by Alexandra and by meeting local First Nations Chief, Ernest Alfred, who is taking a powerful stand for the salmon and his people, Ashleigh finds her own voice on the issue in the most powerful way she knows – through music. Hear the Call climaxes with a musical and visual call to action that engages audiences in a concerted campaign to stop this affront of the ecology and cultures of BC’s wild coast. Clayoquot Salmon Festival and the Maq Hotel present the “Spawn Til Dawn” Dance Party soul slanging singer, multi-instrumentalist & beat maker, Frase, and Tofino’selectro-popp duo, Butterflywingtip. Frase is a multi-instrumentalist and producer originally from Montreal but currently residing in the little old town of Ymir, BC. As a solo artist he has been busy touring Internationally since 2015, throughout India, Italy, France, Germany, Bulgaria, Czech Republic, Australia, Jamaica & North America, fine tuning his live show and building a fan base each step of the way. Frase likes to blend the sounds of hip-hop, soul, dub, reggae and blues with the modern dance floor flavours of EDM and House. For his live show he sings & plays guitar, keys, drums and DJ his beats in Ableton Live. He has been lucky to support and share the stage with such artists as: Dub Fx, Bonobo, Fat Boy Slim, Noisia, Moontricks, Exmag, Chali 2na, & the Funk Hunters. He also Supported Moontricks on their 17 shows winter tour and then last summer he played all over BC Including : Shambhala’s 20 year Anniversay, Tall Tree, Kamp, Blessed Coast, Starbelly Jam, Unity, Atmosphere, & Kaslo Jazz. Frase recently released his first length album called “FRNZ”. BUTTERFLYWINGTIP is a production duo from Hamilton, Canada, based in Tofino BC, formed in 2013, by Katherine Stares (synth, percussion, and vocals) and Steve Bick (guitar, synth, samples, vocals). They define their sound as roots-electro, dancehall pop, and surf-dub. Bick and Stares are influenced by artists like Bon Iver, J Dilla, King Tubby, Hudson Mohawke, Bjork, the Wu Tang, Bad Brains, Television, and War Paint, to name a few. They write and record in the rainforests of Tofino, British Columbia. They have released three EPs, Wolf Piece (2013), Birth Weight (2017), and “Imitating Art’ (2017). Hosted by Surfrider Pacific Rim. Come and celebrate the annual Clayoquot Salmon Festival, held by the Friends of Clayoquot Sound. Campaigner Jeh Custerra and Surfrider volunteers will be leading this clean up on Mackenzie Beach. Keeping our beaches clean and collecting data to address marine debris works to protect all aquatic species, which includes the west coast keystone species, salmon. A traditional salmon bbq will be provided by Surfrider Chair Jason Sam! Refreshments also provided, remember to BYO mug! Clayoquot Salmon Festival and the Maq Hotel present a night of live hip hop and passionate poetry featuring Rhymethink’s Kay the Aquanaut and Tuff City’s Lizzy Be. Hosted by Praxis Life. Kay the Aquanaut is one of the most successful and hard working independent musician’s within the Canadian hip-hop genre. He has released six solo albums, one album as a member of the group Metropolis Now, and over a hundred songs in the last decade. From his previous releases ‘Spinning Blue Planet’ and ‘Nickelodeon Ethics’, Kay has been able to tour across Europe, S.E. Asia, and Canada and gain a very loyal fan base along the way. Over the last few years, the Aquanaut has matured from his reputation of being a spirited and intense live performer and has grown into a captivating singer/songwriter. With clever lyrics, catchy choruses, and a passionate delivery, Kay continues to develop into one of the most innovative and intriguing indie rappers in the contemporary scene. After a decade of frontlines organizing in solidarity with Indigenous land defenders and water protectors — against tar sands extraction and pipelines, nuclear reactors and waste disposal, gold and copper mines, ancient forest logging, GMO agriculture, and fish farms — Praxis Life hunkered down at the end of road within the ancient rainforest beside the ocean to complete an album. Living in Tofino within unceded Tla-o-qui-aht Territory on the west side of Vancouver Island, frontlines solidarity remains a big part of Praxis Life. And the music is integral to his revolutionary life. As a performer Praxis Life has shared stage with many artists that continue to inspire his music: Talib Kweli, D.O.A., Zion I, Micahel Franti & Spearhead, Caleb Hart & the Royal Youths, Nomadic Massive, Abstract Rude, Erica Dee, Def 3, and The Gaff. Once the new album drops it’ll be time to tour! Raincoast Education Society presents a guided, relaxing walk through the wonders of the salmon forest to better understand ecological interactions while exploring the relationship between marine-terrestrial ecosystems. This guided walk draws on both scientific and cultural perspectives to provide a unique understanding of the globally significant salmon related ecosystems of the region. From the rare coastal rainforests to the rich marine environment to the impressive wildlife migrations, our guided walks explore the incredible diversity of flora and fauna found in the Clayoquot Sound Region. Join David Suzuki Foundation Fellow, Melina Laboucan Massimo of the Lubicon Cree First Nation, for an inspiring presentation climate impacts to local solutions. Growing up in one of the world’s most intensive fossil fuel extraction projects in the tar sands, Melina Laboucan-Massimo became increasingly aware that our current global energy strategy is unsustainable. After witnessing a massive oil spill in her home community, she dedicated her work to building renewable energy solutions that are key to a community’s health and vitality. Join this session to find out how Indigenous communities are implementing clean energy projects, and how women in particular are creating climate solutions critical to addressing the growing impacts of climate change. Neo-soul, hip-hop, electro, jazz-fusion, funk, reggae….genres dissolve at the flood of groove that is The OM Sound. Founded in BC and based in Montreal, their mesmerizing music continually pushes instrumental and lyrical boundaries. After returning from 18,860 kms on tour across Canada, The OM Sound is back in the studio. A full length album is in the works, to be released by summer 2018. It will feature the full range of their musicianship and genre-defying grooves.